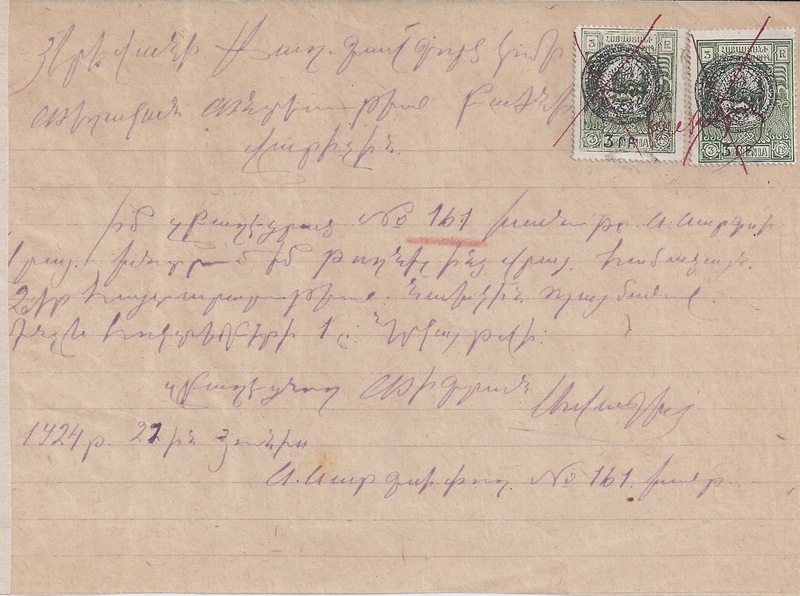 This is the last of three Blogs about forged and faked Armenian Revenue Documents. In the next couple of Blogs I will balance the story with some genuine material. In 1920, the Paris Chassepot printing works produced for Armenia's new Dashnak government an attractive and well-printed set of ten pictorial stamps. According to all the authorities, only the low values - in principle 1 to 15 rouble - were sent to Yerevan. The high values never got sent because the Dashnak regime collapsed. The high values were sold off in Paris, along with the balance of the printing of the low values. It is also the case that, for unknown reasons, the low value 3 rouble green was either not sent or never arrived: see Zakiyan page 59 and Artar page 126. Only the 1, 5, 10 and 15 rouble actually made it to Yerevan. The best proof that the 3 rouble was not available in Armenia is the fact that when in 1922 the low values were pressed into fiscal use, the 5, 10 and 15 unit-of-currency stamps were not re-valued when overprinted whereas the "1" stamp was revalued to "3" in a separate printing operation. The need for a "1" stamp was met by overprinting an old 75 kopeck Imperial fiscal. Had the 3 rouble green been available then both it and the 1 rouble could have been pressed into service without the trouble of revaluation. ARTAR's page 126 understanding of the position - that the 3 rouble was just not available - does not stop him from later illustrating a fiscal overprint on the 3 rouble green, giving it a $450 and $500 valuation (page 131). In contrast, Zakiyan remains consistent in his fiscal listing (page 66) making no further mention of the 3 rouble green. Here are two copies of the 3 rouble green, apparently overprinted for fiscal use, and apparently used on an Armenian document. Either the authorities have got it wrong or we have here a Discovery. 1. 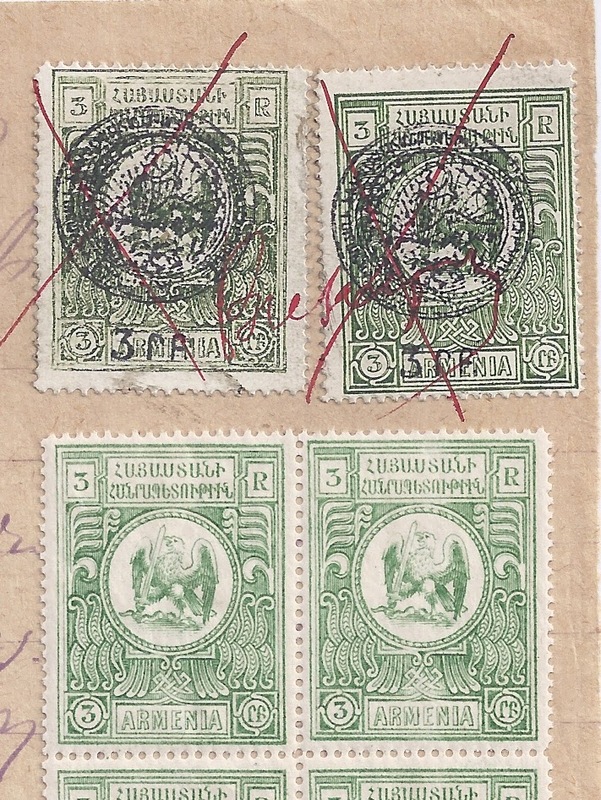 The document is dated June 1924, by which date fiscal stamps of the Soviet Union were in general use in Armenia. The document appears to be cut down in size and may have originally carried a Soviet fiscal. Late use of Chassepot stamps - used in 1922 - 23 - is very improbable. 2. The forger has copied the overprint used on the 1 rouble, which underneath the Arms revalues it to "3 rf" in Armenian script. The revaluation is redundant on this stamp. The forged overprint is probably a digital one. Not even a Nice Try by the Forger. End of story, except for the fact of those $450 - $500 valuations sitting in Artar waiting to tempt another forger to create non-existent stamps.